Fiddle Class, Friday Concert. Moi resplendent in Turquoise! Well now. This is a tricky post to get my head round. I have to be up front and say it has absolutely NOTHING to do with either textiles are art journaling. But it is to do with music, and therefore legitimate blog fodder, I'm sure you'll agree. But thanks for all the comments on the previous couple of posts, and I have answered them! I think the easiest thing to do is just post the photos and try and remember what was going on in each one. 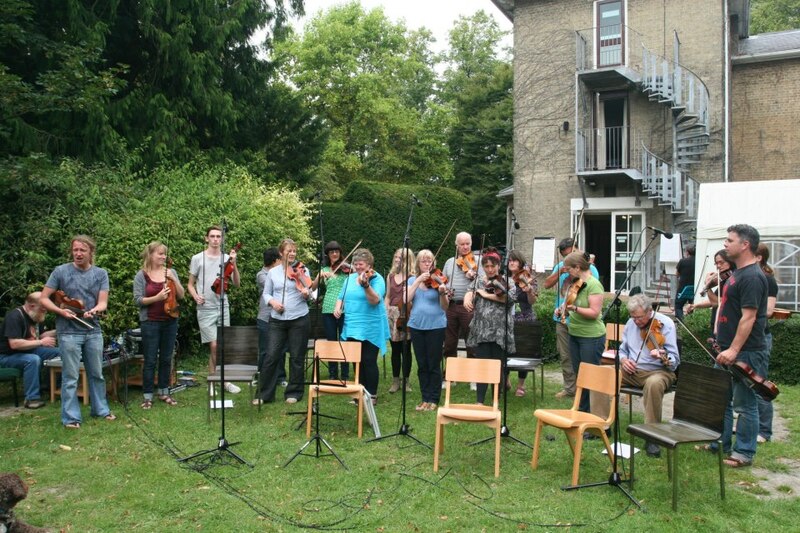 I can't begin to express adequately the magic that is the annual Burwell Bash, when people turn up with their fiddles, flutes, whistles, guitars, and piano accordians for the tutored classes, but also sneaking in other illegitimate instruments such as melodeon (me), violas, mandolins, bouzoukis, broomstick basses, double basses, cellos, djembe, cymbals, trumpets, saxaphones, clarinets,.......correct me if I've missed any out! Suffice to say there is non-stop music going on. No tv, no radio, no newspapers...who would have time to read one? Emily and Gina......ha, Jude thought she was safely out of shot! Anyway, the eager ones turned up on the Sunday, and right after supper a session got under way outside the lounge. I do believe that's me! Session moved indoors about 11pm. Here are Sam and Yael. Jayne, Hattie and Debs. OH! And Mr Meloedeon! Monday everyone else arrived and the course got under way. Burwell House look after us beautifully, the staff welcoming us back year after year, like old friends. I can't tell you how well the whole thing just moves smoothly on, we certainly aren't aware of the 'seams' though I'm sure behind the scenes there is furious paddling going on all the time. James, Mr Burwell House himself, manning the bar. Sorry, not the best shot, but here is Stephen looking pensive at set-up time, Concert Night. Jumping about a bit here, but trying to be chronological and explanatory at the same time - failing on both counts! The tutors for the Bash are as follows. Google them, as they are all incredible performers, talented and generous musicians who play solo, together, and with a plethora of other well-known musicans and bands. This is Jock Tyldsley, fiddle tutor, who came to Burwell my first year. Tola's debut at Tutors' Concert. Responsible for more than a few philosphical digressions during class, Tola never the less managed to impart some fab tunes, two of which I have in my head all day . Stephen presenting Brian with his birthday cake..made by the Burwell staff. Assisting Brian is Katherine Mann who is surely one of the earliest Burwell-goers, from childhood. This year Katherine came accompanied by husband and baby. Ed Boyd tutors the guitar class. Another ex member of Flook, Ed has played with bands and solo artists too numerous to mention; he's always in demand because his talent is widely sought after. Honestly you have to google these guys to understand just what top-notch tuition goes on here. The running joke at Burwell is Ed's iron - or lack of one! Last but certainly not least, we have piano accordian tutor Sam Pirt. What can I say about Sam? Musically, I think, he's a genius. No, seriously, stand him in a room with 50 or so music students on various instruments, no music, a tune off the top of his head, and within 20 minutes or so he will have us all having learned the tune, taken it apart, put it back together again and re-arranged in several variations. The end result is...mind blowing! And it isn't prepared. I don't think Sam reads music. Anyone who can arrange a piece for five different instruments and 50 players, on the hoof, in 20 minutes, has to be pretty special, don't you think? We do. Every year I tell Sam I am getting speaking to his mum about the adoption papers! Sorry, lousey shot, Sam doing some foot percussion, which he usually does while playing. The lap-top you can see there was enabling a link-up with Helen, a regular flute student who was unfortunately in California so unable to join us. We had her on skype for about 4 hours while she chatted to all of us and then she watched the concert! Sam plays in so many bands I couldn't name them all. 422, and The Hut People are the ones I mostly know him from. He plays an eclectic variety of music, all of it hugely rhythmic and attention grabbing, particularly the south American Foro and Poro tunes. This year Iwas in Sam's Mixed Band (Next year again, please, Stephen!) and we did two cracking numbers. Truth to tell, I was torn by wanting to buy a piano-accordian just so I could play the sort of music Sam plays. Not that I would leave the fiddle class ; ) ! Oh, so tempted. But I think I will continue with my melodeon, which I do love. Ok, I am slowly losing the will to live here, going back and forth between photos, so just a few more general shots. John, married to Jude, and all-round good egg and stalwart regular. Eddie, piano-accordianist, saxophonist, and BBC sound man. Sam and Thelma.........don't ask! I think she looks as if she's been knocked out and is going down for the count! Ellie is another student who has been coming to Burwell since babyhood. Here she is doing a guest spot with her band Kiss The Mistress..unfortunately I couldn't squeeze John on bhodran into the shot, but he was dead good! Their set was absolutely brilliant. Martina from Vienna, and behind, Caroline, from a bit nearer! It's a brave Frenchman who proudly sports the Union Flag on his chest! Damien. Well, do you know, I think that's your lot. Normal service will be resumed next post! Sorry my plan to explain more about the course fell by the wayside, as I'm in a hurry to get this out. However, I think the photos speak for themselves. To fill yourself in, google Burwell Bash and have a read, also you'll find most of the tutors on youtube, somewhere! Now I'm going to lie down in a darkened room! Catch you next time. Your post must have taken ages to write! It looks like you all had a really good time, bet it was a shame when you had to leave and go home. I am glad that Burwell House is still such a well used facility so few community places in the country are still going. I remember years ago attending a Girl Guide do there with lots of branches all piled in together with activities etc. We were all given a space for each patrol to use for the weekend as a base and I seem to remember that the weather was really hot. But then it was hot more often in the 1980's! I was visiting my Mum in Burwell from the 8th of August and it was almost too hot, unlike Cornwall where even the ducks wear wellies. We have good weather EVERY year...it's the Burwell Bash Effect! Yes, I'm experiencing the Post-Burwell Blues! Mel it'll be lovely to have you back again...except I'm not sure we can squeeze another bed into Becket!!! Excellant I look forward to early September when you can tell me more and play some tunes. Hello Anonymous.......er....be great to play some tunes with you......whoever you are!! Put your name somewhere!!!!!! OMG- I havent seen Jock Tyldsley since his Flatville Aces days when I used to run cajun workshops in dorset!!!! He has put on a few pounds but still looks great! Oh my, really really envious of all of you tha can play an instrument especially fiddle!! Oh Gawd, Heather....just as well he probably won't be reading the blog! Now you see, I'm envious of you doing the Cajun thing. It was a brilliant week, and always is. What a great post!! I'm a folk festival co ordinator so you can imagine hw much I'd like your bash. Hi Ada,...guess I can put whatever I like in my blog, but some people only read it for the textile content....patience, dear hearts, patience! What music is your husband inot? It sounds and looks like brilliant fun - you obviously enjoyed it - it's so fulfilling to share a passion with others like that. Did your fiddling improve though? Well now, Cathy, I did feel this year that I was picking the tunes up so much faster than usual. also when it came to the final Friday Concert, I felt very laid back about it instead of nervous - and I HONESTLY didn't need to do any 'air fiddle' at spots where I got lost, I could play all four tunes we did right through. So there must have been some improvement! I suppose overall I learned 14 tunes - not bad for 5 days, eh? It sounds like you had a fabulous time - loved all the photos. Sorry! Where did I get John from? ANyway, glad you like it. Was a great evening in a fabulous week.